Just a reminder to enter My Giveaway that ends May 7th. People seemed to like one of previous posts with China Glaze glitters so I decided I swatch all the ones I have for you all! 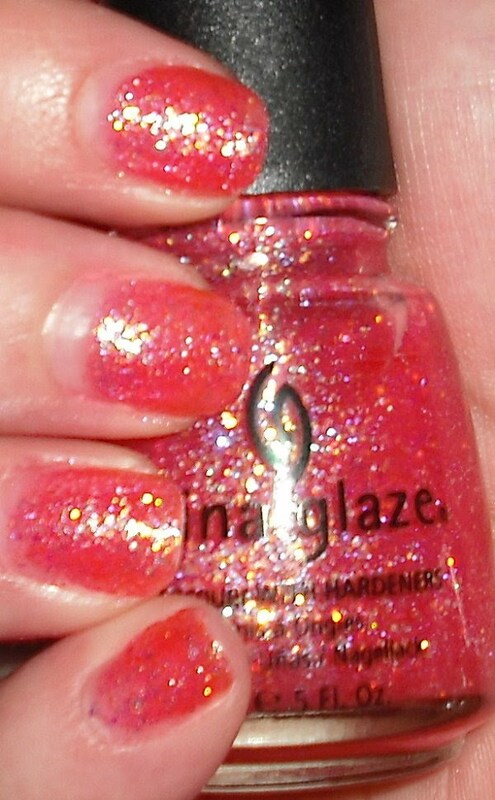 This is what I'd consider a pink-salmon colored jelly with chunky iridescent glitter. 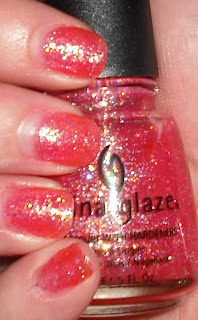 I say take your time applying these because they are chunky glitters so make sure to try and get an even application. I used 2 coats. I love this one. It would be a great summer color! This is 3 coats, but you could go for 4. 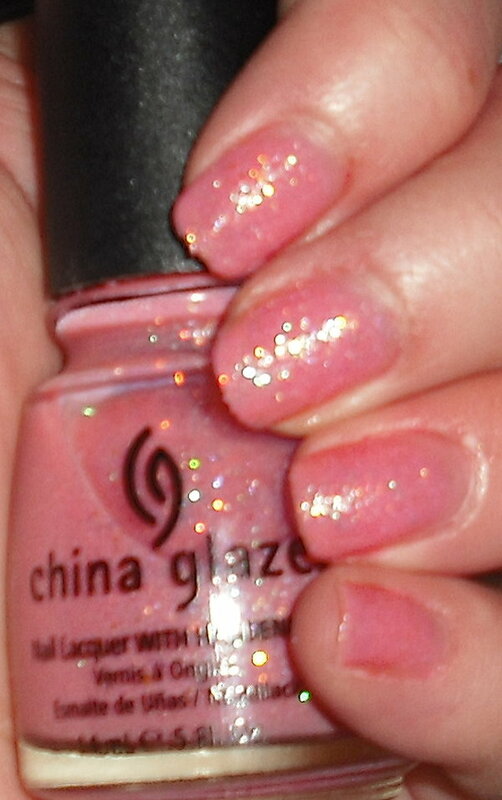 This is a pale pink jelly with chunky iridescent glitter. I like this one, but it isn't my favorite. I thought it was going to be a bit more pigmented with color, but it could just be my skin tone. I used 3 coats. 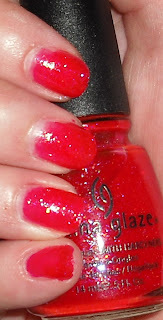 This is a red-magenta jelly with chunky iridescent glitter. This probably my favorite of the bunch because of the color payoff. It's very striking and glittery. I used 3 coats. This is primarily a gold chunky glitter with silver holographic glitter mixed in. This definitely needs a lot of coats. I used 3, but I'd go with 4 or 5. This is very blingy for sure! 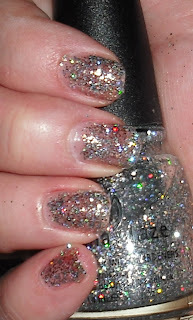 This is primarily a silver chunky glitter with holographic glitter mixed in. This one definitely makes a statement! I used 3 coats, but it needs 4 or 5. Wow, what a nail polish! Don't you think? That's all the swatches I have for today, but as I was swatching by boyfriend noticed we had a friend walking around outside our patio of our apartment. Behind our apartments we have this little marsh area where there are typically a lot of wild birds. They rarely decide to walk up the marsh into the courtyard of the apartments but this guy decided to venture out this afternoon. Isn't he a handsome fellow? Or a beautiful girl? This is what I believe to be called a "Sandhill Crane". These are big birds probably close to 4ft tall. They are very beautiful. Last spring I saw a family of them and they were always together. They are quite loud though! They will wake me up some mornings with their squawking, but it's nice to have some wildlife outside your front door! Holy Glitteroly! I'm not a huge glitter fan but you have a great variety and selection. I love Bad Kitty! Actually, I think its really fun to say "Bad Kitty" LMAO. I really don't say that often! The bird is cool too. Did your kitteh go crazy when it saw the bird? Yes, my cat did go crazy when she saw the bird. She started darting at the window. She's an indoor cat, but my boyfriend carried her outside to see it and she didn't care for that. She thinks she's all brave when shes inside but outside she's a scardy cat. LOL I think we own very similar animals.